Yes, it's a brand-new look for macilife.com! As I mentioned in a previous post, I recently commissioned Seattle-based Textura Design to redesign this site, which had grown creaky and funky over the years. They've done their work, and magnificently. The new design not only allows for specific pages for iWeb and GarageBand, but it loads much faster and will be easier for me to maintain. And its underlying HTML code is a thing of utter beauty. It may not mean much to you if you aren't involved in the Web design scene, but the old code behind these pages was outmoded and archaic. The new code, largely the work of Matthew Foster, is modern, elegant, and clean—crafted and presented like a dinner at fine restaurant. Now it's my turn: In the days (weeks?) to come, I'll be adapting the site to incorporate the new look throughout. I'll add those long-awaited GarageBand and iWeb pages, and update the pages for iTunes, iPhoto, iMovie HD, and iDVD, too. More podcasts are in the works, too. And let me know what you think of the new look. I've already sung the praises of Photojojo, a cool email newsletter devoted to digital photography. Today's issue brings a five dollar bill, sort of. You can get a free copy of Monkey Business Labs' Picture Framer Deluxe, a normally $5 (US) Dashboard widget that displays photos in a variety of frame designs. I've got my copy set up to display photos from—where else?—Flickr. Go grab yours. And subscribe to Photojojo while you're at it. 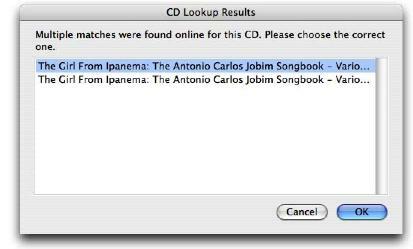 I was ripping an audio CD yesterday and iTunes displayed the dialog box you see here. Hmmm. Which one do I want? There's no way to tell the difference—this particular iTunes dialog box lacks a horizontal scroll bar or size control that would allow me to see how the two entries differ. I can't remember which one I chose, but I did get the correct track names. O'Reilly Media published a nice round-up of audio plug-ins last week. Many of these are overkill for GarageBand users (if they run in GarageBand at all), but the article is still an interesting look at the versatile universe of audio add-ons. Seven months in the making—no, not really—episode two of my podcast is now available for your insomnia-curing pleasure. This site is the online companion to my book, The Macintosh iLife '06, published by Peachpit Press and Avondale Media. If you like this site, you'll love the book. Get your copy of the world's top-selling iLife book. Order from Amazon and save 37 percent off the cover price.